The following is a timeline of the history of the city of Tulsa, Oklahoma, United States. Indian Territory, Eastern part of present-day Oklahoma. 1826 – Creek Indians began to settle town of Tulasi after their expulsion from the Southeastern United States. 1878 – First post office established at Perryman ranch. 1882 – Atlantic & Pacific Railroad tracks laid from Vinita. 1884 – Presbyterian church founded a mission day school that became the first public school after Tulsa was incorporated. 1893 – Indian Republican began publication as first newspaper. Edward E. Calkins becomes first mayor. First mass said at Holy Family Church. Robert H. Hall built the first telephone system in Tulsa, serving 80 subscribers. Commercial Club of Tulsa formed. 1901 – Oil discovered at Red Fork, near Tulsa, starting oil boom. 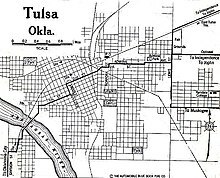 1902 – Tulsa chartered as a city. 1903 – Telephone system sold to Indian Territory Telephone Company. First Tulsa bridge built across Arkansas River. Pumping plant built to deliver Arkansas River water to consumers via piping system. Tulsa World newspaper begins publication. Oil discovered at Glenn Pool near Tulsa. First two public schools built. Tulsa Hospital opens (would close after WWI). Oklahoma Natural Gas Company, now named OneOK, founded. Downtown Tulsa, looking east on 2nd Street from Main Street, 1908. Tulsa becomes part of the new U.S. state of Oklahoma, and county seat of newly formed Tulsa County. Henry Kendall College moved from Muskogee to Tulsa. Commission form of government adopted. Orcutt Lake and Amusement Park, privately owned and developed, opened, advertised as Tulsa's first playground. West Tulsa becomes part of Tulsa. Tulsa buys land that would become Woodward Park. Tulsa County Court House built. Exchange National Bank founded after failure of Farmers' National Bank. Texaco builds first oil refinery in West Tulsa. Oil & Gas Journal, oil industry trade journal, headquartered in Tulsa. Area of city: 3.5 square miles. Hotel Brady annex and Tulsa Hotel were built. Booker T. Washington High School established. Joshua Cosden builds second oil refinery in West Tulsa. 1916 – Carnegie library opens, forerunner of the Tulsa Public Library system. Orcutt Lake Amusement Park closed and converted to Swan Lake residential area. Gus Orcutt sold his development to Tulsa developer, E. J. Brennan, who coined the name Swan Lake. Brennan donated the lake itself to the City of Tulsa as a public park. Cosden Building constructed, considered first "skyscraper" in city. Henry Kendall College becomes University of Tulsa. Tulsa Tribune newspaper in publication. May 31 – June 1: Tulsa race riot devastated Greenwood. All Souls Unitarian Church founded. Major flood of Arkansas River heavily damages Tulsa water purification plant and causes its relocation to a site near Mohawk Park. Southwestern Bell Telephone Company constructs Main Dial System Building. 1925 – Mayo Hotel built. Tulsa State Fair grounds in use. Red Fork becomes part of Tulsa. Goodwill Industries of Tulsa incorporated. Carbondale becomes part of Tulsa. Spartan Aircraft Company in business. Spartan School of Aeronautics established. Boston Avenue Methodist Church and National Bank of Tulsa Building constructed. Mohawk Park Waterworks Plant completed. Public Service Company Building completed. Cain's Dance Academy in business. First All Souls Unitarian Church completed. Tulsa Fairgrounds Pavilion (arena) built. Waite Phillips donated his home to become Philbrook Art Museum. 1934 – National Conference of Christians and Jews Tulsa chapter founded. Morningside Hospital reorganized and renamed as Hillcrest Hospital. Will Rogers High School built. 1941 – Air Force builds bomber plant at Tulsa Airport. 1943 – Oklahoma Hospital becomes Oklahoma Osteopathic Hospital. 1946 – American Airlines opens aircraft maintenance facility at Tulsa Airport. 1948 – Tulsa Opera and Tulsa Philharmonic founded. Dawson becomes part of city. 1951 – Bell's Amusement Park opens. 1952 – Lake Eucha and second pipeline from Lake Spavinaw to Tulsa constructed to supplement city water supply. Golden Driller statue created for and displayed at the International Petroleum Exposition. Tulsa Metropolitan Area Planning Commission established. 1954 – KTUL-TV and KVOO-TV (television) begin broadcasting. Highland Park becomes part of Tulsa. Tulsa Ballet and Tulsa Baptist Association founded. Gilcrease Foundation conveyed Gilcrease Museum to the city. Area of city: 50 square miles. 1961 – New airport terminal opened. 1963 – Tulsa Youth Symphony founded. 1964 – Tulsa Convention Center opens. Tulsa City-County Library Central Library opened. Tulsa Expo Center built; Golden Driller statue permanently installed. James M. Hewgley, Jr. becomes mayor. Prayer Tower and Fourth National Bank of Tulsa built. Union Depot abandoned after passenger train service ceases. Robert J. LaFortune becomes mayor. 1971 – Tulsa Port of Catoosa opened to shipping via the McClellan-Kerr Arkansas River Navigation System. Roman Catholic Diocese of Tulsa established. Area of city: 175.71 square miles. 1973 – First National BanCorporation Tower built. 1974 – Tulsa Area United Way active. Williams Brothers Tower (now named BOK Tower) built. Memorial Day flood causes major damage along Mingo, Joe and Haikey creeks. Woodland Hills Mall in business. Tulsa Central High School moves from Downtown facility to new Osage County facility. Former school leased to Public Service Company of Oklahoma as new headquarters following remodeling (repurposing). 1977 – Tulsa Performing Arts Center opens. Final occurrence of International Petroleum Exposition. Mike Synar becomes U.S. representative for Oklahoma's 2nd congressional district. Tulsa Oklahomans for Human Rights group formed. City of Faith Medical and Research Center opens. Tulsa Community Food Bank and Heller Theatre founded. 1983 – Swan Lake Neighborhood Association and Gilbert and Sullivan Society of Tulsa founded. Chili Bowl midget car race begins. Jim Inhofe becomes U.S. representative for Oklahoma's 1st congressional district. 1988 – Tulsa Preservation Commission and Oklahoma Jazz Hall of Fame established. Mayor-council form of government adopted. Southwest Tulsa Chamber of Commerce formed. 1991 – Urban Tulsa Weekly newspaper begins publication. Tulsa receives 1992 Outstanding Public Service Award from Federal Emergency Management Agency (FEMA) for its flood management program. Tulsa Tribune goes out of business. Susan Savage becomes first woman to serve as mayor of Tulsa. 1996 – Camille's Sidewalk Cafe in business. 1997 – Conestoga science fiction convention begins. Tulsa Air and Space Museum established. Hindu Temple of Greater Tulsa founded. 2000 – Population: 393,049; metro 859,532. Tulsa's skyline from Central Park in 2008. 2004 – 11th Street Bridge renamed as Cyrus Avery Route 66 Memorial Bridge. Oklahoma Center for Community and Justice headquartered in Tulsa. 2006 – Bell's Amusement Park goes out of business. Union Depot building converted to house Oklahoma Jazz Hall of Fame. University of Tulsa selected to manage the Gilcrease Museum. Tokyo in Tulsa anime convention begins. Tulsa Botanic Garden opens to public. Dewey F. Bartlett, Jr. becomes mayor. This Land Press begins publication. Area of city: 196.75 square miles. Oil Capital Historic District created on December 10, 2010. 2012 – Oklahoma Defenders football team active. Tulsa Convention Center renamed as Cox Business Center. Center of the Universe Festival (music fest) held. Woody Guthrie Center opens as museum and archive for the artist. Jim Bridenstine becomes U.S. representative for Oklahoma's 1st congressional district. Construction begins on Phase 1 of Cousins Park. Helmerich Center for American Research at Gilcrease Museum completed. James Pepper Henry becomes director of Gilcrease Museum on March 1. Oklahoma Defenders football team ceased operating. Vision 2025 Tax plan approved by voters to provide funding for planned major projects. Former PSO headquarters renamed as Art Deco Lofts and Apartments; new residents begin move-in in July. 2017 – EF-2 Tornado strikes southeast Tulsa after midnight August 5–6, causing major property damage, no deaths, and sends 32 people to hospitals. 2018 – "Gathering Place" holds grand opening to public on September 8. ^ a b c Federal Writers' Project 1941, p. 204: "Tulsa"
^ "Tulsa Gal: Indian Republican Newspaper." ^ a b c d e f g Britannica 1910. ^ "Holy Family Cathedral School: Tulsa's First Catholic School. ^ a b Douglas 1921. ^ Tulsa Preservation Commission. "Urban Development (1901–1945)" Accessed May 5, 2011. ^ a b City of Tulsa. "Water Supply Lakes - Eucha and Spavinaw Watersheds." ^ a b "US Newspaper Directory". Chronicling America. Washington DC: Library of Congress. Retrieved March 3, 2014. ^ Glenn Pool Oil Field Educational Center. "History of the Oil Boom: The Ida E. Glenn Discovery." Retrieved May 6, 2014. ^ a b c d e f Tulsa County Medical Society. "A History of Tulsa Hospitals" Retrieved December 1, 2012. ^ a b "Transportation (1850-1945)". Tulsa History. Tulsa Preservation Commission. Retrieved March 3, 2014. ^ Field, Eugene. "Growing Together: West Tulsa." Retrieved May 6, 2014. ^  Tulsa Garden Center. "Woodward Park Complex."] Retrieved December 21, 2011. ^ "Sketches for Court House and County Jail." The American Contractor. Accessed July 15, 2015. ^ OKLAHOMA BANKS CLOSED. ; New York Times. "State Concern Forced to the Wall by Failure of National Bank." ^ a b c d e f g h "History of Tulsa Annexation" (PDF). Tulsa City Council. 2004. ^ "Tulsa, Oklahoma". Encyclopedia of Southern Jewish Communities. Jackson, Mississippi: Goldring / Woldenberg Institute of Southern Jewish Life. Retrieved March 3, 2014. ^ "Library History: Chronology". Research Guides. Tulsa City-County Library. Retrieved March 3, 2014. ^ "Living Places: Swan Lake Historic District" 2011. Accessed June 6, 2015. ^ a b Pluralism Project. "Tulsa, Oklahoma". Directory of Religious Centers. Harvard University. Retrieved March 3, 2014. ^ a b "American Association of Community Theatre". Retrieved March 3, 2014. ^ a b c d Weaver, Bobby D. Encyclopedia of Oklahoma History and Culture. "International Petroleum Exposition." Retrieved May 7, 2014. ^ a b c "Flood Control and Drainage." City of Tulsa. Retrieved May 25, 2014. ^ a b "Southwest Tulsa on Historic Route 66". Southwesttulsa.org. Retrieved March 3, 2014. ^ Tulsa Preservation Commission "Transportation (1850-1945)." Retrieved January 14, 2011. ^ a b "Spartan Aircraft Company". Encyclopedia of Oklahoma History and Culture. Oklahoma State University. Archived from the original on October 18, 2010. Retrieved January 25, 2011. ^ "Military – Air Force Plant No. 3, Tulsa, OK". Global Security Website. ^ "Movie Theaters in Tulsa, OK". CinemaTreasures.org. Los Angeles: Cinema Treasures LLC. Retrieved March 3, 2014. ^ Erwin, Sarah. Encyclopedia of Oklahoma History and Culture. "Gilcrease Museum." ^ a b Mike Tigas and Sisi Wei (ed.). "Tulsa, Oklahoma". Nonprofit Explorer. New York: ProPublica. Retrieved March 3, 2014. ^ Cantrell, Charles (July 14, 2008). "City and Airport Long Time Partnership Continues". GTR Newspapers. ^ Wilson, Linda D. Encyclopedia of Oklahoma History and Culture. "Oral Roberts University." Archived 2010-03-12 at the Wayback Machine Retrieved May 7, 2014. ^ Tulsa City-County Library- Central Library Retrieved May 7, 2014. ^ Laurie Winslow, "Bank of Oklahoma celebrates 100 years", Tulsa World, November 15, 2010. ^ Taylor, Jonathan (November 2008). "The Lost Twin: The Lone, Shrunken World Trade Center Tower in Oklahoma". The Believer. ^ "Oklahoma". Official Congressional Directory. Washington DC: Government Printing Office. 1983. ^ a b Marlin Lavanhar (2007). "Tulsa: a Divinely Inspired City". In Davis D. Joyce (ed.). Alternative Oklahoma: Contrarian Views of the Sooner State. University of Oklahoma Press. ISBN 978-0-8061-3819-0. ^ "Oklahoma Food Banks". Food Bank Locator. Chicago: Feeding America. Retrieved March 3, 2014. ^ "Oklahoma". Official Congressional Directory. Washington DC: Government Printing Office. 1989. ^ "History of the Tulsa Preservation Commission". Tulsa Preservation Commission. Retrieved March 3, 2014. ^ "Welcome to the City of Tulsa Online". Archived from the original on February 2001 – via Internet Archive, Wayback Machine. ^ "Tulsa (city), Oklahoma". State & County QuickFacts. U.S. Census Bureau. Archived from the original on March 22, 2009. ^ "Oklahoma". CJR's Guide to Online News Startups. New York: Columbia Journalism Review. Retrieved March 3, 2014. ^ a b "Tulsa (city), Oklahoma". State & County QuickFacts. U.S. Census Bureau. Archived from the original on March 22, 2009. Retrieved March 3, 2014. ^ Civic Impulse, LLC. "Members of Congress". GovTrack. Washington, D.C. Retrieved March 3, 2014. ^ "Helmerich Center for American Research at Gilcrease Museum." Hastings+Chivetta . 2016 Accessed November 3, 2016. ^ Lohman, Rich. "Oklahoma Defenders go dormant." Tulsa Today. Accessed July 15, 2015. ^ Federal Writers' Project 1941, p. 415: "Chronology"
Tulsa, Oklahoma Directory. Hoffhine. 1910. Tulsa City Directory. Polk-Hoffhine Directory Co. 1920–1922. James M. Hall, The Beginning of Tulsa (Tulsa, Okla: N.p., 1933). Angie Debo, Tulsa: From Creek Town to Oil Capital (Norman: University of Oklahoma Press, 1943). The Tulsa Historic Preservation Plan (Tulsa, Okla.: Tulsa Preservation Commission, 1992). David J. Wishart, ed. (2004). "Cities and Towns: Tulsa, Oklahoma". Encyclopedia of the Great Plains. University of Nebraska Press. ISBN 0-8032-4787-7. Carl Gregory (2007). "Tulsa". Encyclopedia of Oklahoma History & Culture. Oklahoma Historical Society and Oklahoma State University Library Electronic Publishing Center. David Goldfield, ed. (2007). "Tulsa, Oklahoma". Encyclopedia of American Urban History. Sage. ISBN 978-1-4522-6553-7. "Chronology of Tulsa Events". Local History in the Research Center. Research Guides. Tulsa City-County Library.